A set of interconnected planetary diagrams covering the Ancient Khmer Empire and brought to light by temples built on key locations reveals capacities, in the fields of astronomy, land-surveying and cartography, which exceed by far the know-how and accuracy previously attributed to Middle-Age scholars. As a matter of fact, the locations provided by the inscription are fully correct if we suppose the degree zero of the first house-sign was Spica instead of zeta Piscium. It is worth remembering the Indian (and the Khmer) used to measure the « ayanamsa » ie the difference of ecliptic longitude between the vernal equinox and the star used as degree zero of their zodiac. These stars were either Spica or zeta Piscium. - Sun, Mercury and Saturn in house-sign 6 ( Aries is house-sign 6 if Spica is degree zero). 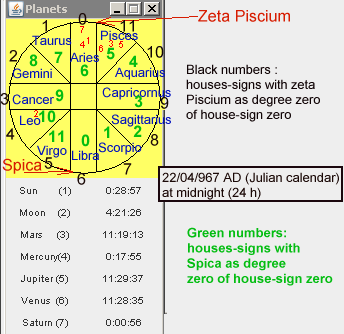 - Mars, Jupiter and Venus in house-sign 5 (Pisces is house-sign 5 if Spica is degree zero). - Sun, Mercury and Saturn (red numbers 1, 4 & 7) were located in the house-sign 0 (numbers written in black colour in the figure). With zeta Piscium used as degree zero (usual convention), the three objects were crossing, roughly, the Aries constellation. It is worth remembering the houses-signs were numbered from 0 to 11. - Mars, Jupiter and Venus (red numbers 3,5 & 6) were located in the house-sign 11 which corresponded to Pisces. Those locations are confirmed by modern software. - Sun, Mercury and Saturn are described to be in house-sign 6 (at first sight Libra). - Mars, Jupiter and Venus are described to be in house-sign 5 (at first sight Virgo). - Moon is described to be in house-sign 10 (at first sight Aquarius). The Indians used apsides lines which were practically fixed with respect to the star used as degree zero (usually zeta Piscium) but the apsides lines were, of course, (due to precession) shifting with respect to the vernal equinox . As our current web page diagrams were drawn from ecliptic longitudes calculated from the vernal equinox (the only method used nowadays), we should have included the precession of the apsides from 499 CE (epoch of reference of Indian calculations) to 967 CE. Unfortunately, we did not include the precessional shift in the current web pages. The current diagrams will need to be corrected (but the differences are not great).